If you are roasting a whole duck, place it onto a baking rack over a baking tray so you can catch all that delicious duck fat as it cooks out. If you want a beautifully cooked duck, never stuff the cavity of a whole duck because this will prevent hot air entering the duck cavity and cooking the meat from the inside as well as the outside. It is ok to stuff a few aromatics into the cavity – orange peel, garlic, a few herbs of your choice – these will add extra flavour to your duck. I always make sure that the skin of my duck is nice and dry; this gives you a nice crispy skin. Duck loves a hot oven. I always roast my duck in a hot oven, no less than190 deg C. Don’t forget to rest the duck once it comes out of the oven. This allows the juice to settle back into the meat. Duck also reheats really well, so if you have any leftover duck, place it in a really nice hot oven and bring it back to life. Crisp the skin up under a hot grill. If you are using a sauce with the duck, place it onto the plate and the duck on top of so that you don’t lose that delicious skin. Saucing on top will make the skin soggy. Chef Tip: Never throw the duck fat away; it’s great for roasting potatoes and sautéing, vegetables and meats and it keeps in the fridge forever. It took me years before I could place a moist, delicious morsel of duck into my mouth without the name Jemima popping into my head – I’m talking Jemima Puddle Duck. I had a duck called Daffy when I was young; if I knew then what I know now! Place the duck in a pot large enough to hold it. Add the star anise, soy and ginger; now cover the duck with water (this is to get a measurement of how much water you need). Remove the duck from the pot and heat the liquid. Return the duck to the pot and simmer for 20 minutes. Remove the duck from the pot, place on a tray and prick the skin all over. Place the duck in front of a fan and let the skin dry. In the meantime mix the rub. Dry-toast the seeds with the Sichuan pepper and grind to a rough texture. Oil the duck gently, and rub the spice mix onto the breasts, the legs and the thighs; turn it over and give the back a rub now. Let it rest while you prepare the marinade. Mix all the marinade ingredients together, except the sesame oil and the cinnamon, and place them in a saucepan. Cook down gently and when the marinade is nice and syrupy, stir in the sesame oil and cinnamon. Place the duck onto a hot baking tray and put into the oven at 190 °C and cook for 10 minutes. Now paint the duck all over with the marinade and return to the oven. Repeat the painting process about 3 times, cooking for 30 minutes. Turn the oven down to 160 °C and paint that duck again. Cook for a further 20 minutes, then wiggle the legs and if they feel loose, remove the duck from the oven and let it rest for about 10 minutes before serving. While the duck is resting, prepare the noodles. Heat the oils in a large frying pan, and add the garlic, mange tout and carrot sticks. Cook stirring for 2 minutes, then add the pre-soaked noodles and soy sauce; heat through and stir in the coriander. 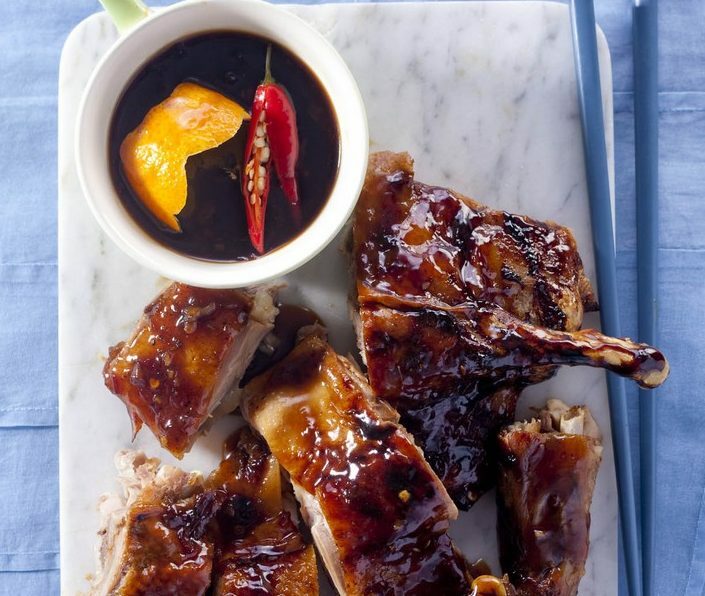 Serve the duck on a bed of soy fried noodles and drizzle with any left-over marinade – make sure that it’s warm now! Tip: If you can’t find Sichuan peppercorns, use 1 teaspoon bashed white peppercorns instead.